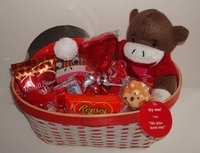 Valentine sock monkey gift basket is the perfect gift for the monkey lover. You get a plush sock monkey that plays "Do You Love Me", a sock monkey shaped box filled with brach's conversation hearts, a sock monkey card game along with a variety of Valentine's day candy. This is a perfect Valentine gift for kids or adults. Sock monkeys have been around forever and are the most popular of monkey's. The recipient will go banana's for this cute gift basket. Each gift basket is red and white wicker, wrapped in a gift bag with ribbon. Add your personalized gift message and have it delivered right to their door.